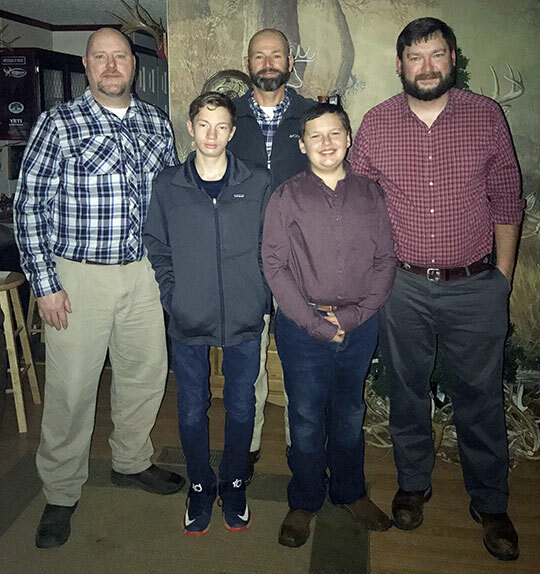 (Back row) Hunt organizer Jeff Carter, is shown with participants (front row, from left) Jason Mitchell and his son Corey Mitchell and Jack Plowman and his dad Heath Plowman. HAMILTON - For the past seven years, Jeff Carter of Pine Hills & Oaks Hollars Childs Classic has been able to appear as a shining light in 15 children’s lives as he offers a weekend of hunting and adventure to those children who have been battling with potentially terminal illnesses and disabilities. Every year since the Wish Hunt was formed through ChildsWish.org, Carter, with the help of several businesses and sponsors, has brought children and their fathers out to the hunt to give them a weekend of deer, rabbit and duck hunting. This year’s hunt occurred from Thursday Jan. 10 to Sunday Jan. 13. The participants were Corey Mitchell, 17, of Woodland along with his father Jason and Jack Plowman, 11, of Gordo with his father Heath. See complete story in the Journal Record.